Comcast dropped a popular rural television network last year right before launching the unproven Al Jazeera America network, one of several concerns raised by witnesses on Thursday about the company’s proposed merger with Time Warner Cable (TWC) and its potential market power. Patrick Gottsch, founder and chairman of the Rural Media Group, said Comcast dropped the group’s independent channel RFD-TV in August 2013 from all of its cable systems in Colorado and New Mexico, just two days before launching Al Jazeera America. Gottsch testified before the House Subcommittee on Regulatory Reform, Commercial, and Antitrust Law to discuss some of the potential effects of the $45 billion merger. While RFD-TV maintained high ratings in both the Colorado and New Mexico markets, Al Jazeera America slashed its staff and expenses last month after averaging just 15,000 total viewers. Comcast owned a small stake in Current TV, the channel formerly owned by Al Gore and others, before it was sold to Qatar’s government last year for $500 million and turned into Al Jazeera America. Gottsch said in his testimony that a combined Comcast-TWC would control 23 of the top 25 television markets in the nation, making it a crucial gatekeeper for independent networks like RFD-TV that need to attract major advertisers. He also noted that Comcast has an affiliation with the Retirement Living TV (RLTV) network, which targets some of the same demographics as RFD-TV. "Isn’t there room for one independent channel devoted to rural interests, which make up 27 million homes in this country?" he said at the hearing. "Just one channel devoted to rural America is all we’re asking for." Gottsch’s testimony echoed broader concerns about the impact of the merger on independent networks and small advertisers. The merger would unite the nation’s two largest cable television and Internet service providers to form a combined subscriber base of almost 30 million. Critics say the companies’ increased market share would lower competition and raise prices for consumers. 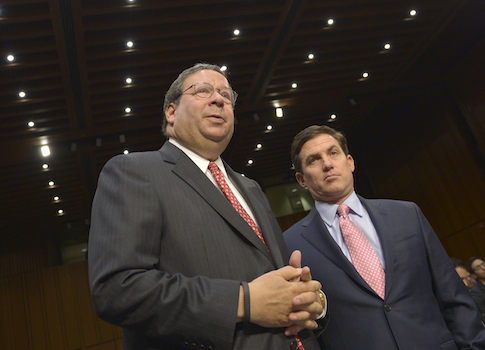 Comcast Executive Vice President David Cohen said the company’s decision to drop RFD-TV was "nothing punitive" and based on higher local market demand for high definition channels. Western markets also have more "bandwidth constraints," he said. Comcast continues to carry RFD-TV for customers in states such as Kentucky and Tennessee. "We are primarily an urban-clustered cable company," Cohen said. "Even in Western states most of our consumers are in the urban area. It is our goal of providing our customers content they want to see." He added that it would be illegal for Comcast to discriminate against new channels in favor of affiliated networks. Cohen was also asked about comments he previously made to reporters that Comcast is "not promising that customer bills are going to go down or that they’ll increase less rapidly." He said instead on Thursday, "this transaction has the potential to slow the increase in prices." Comcast needs more scale to invest in better technologies and services and compete with other emerging providers such as Google and Apple, he argued. "Consumers will be the big winners in this transaction," he said. Comcast’s extensive ties to the Democratic Party have raised additional concerns about the merger and the company’s potential control of political programming and advertising. The company’s employees, their family members, and its political action committee have donated more than $33 million to political campaigns since 1989, with about $18 million of that going to Democrats. CEO Brian Roberts is a golf buddy of President Barack Obama and a major Democratic donor, while Cohen has raised millions for the president’s campaigns. Comcast completed its $30 billion purchase last March of NBC Universal, an operator of networks such as NBC and the left-leaning MSNBC. Michelle Obama and Vice President Joe Biden have appeared on the networks numerous times. Al Jazeera America is also viewed as a left-leaning network. Additionally, the merger would grant Comcast significant control of the $5.4 billion local cable advertising market, including political advertising. Small advertisers say Comcast could use its market dominance to favor regional and national advertisers, preventing local businesses and political campaigns from "geo-targeting" residents in specific counties and congressional districts. Sen. Al Franken (D., Minn.) has criticized Comcast for "swarming Capitol Hill [with] their lobbyists" as congressional committees and government agencies evaluate the proposed merger. Comcast now employs more than 100 lobbyists, including former congressional staffers with knowledge of antitrust issues and commissioners for the Federal Communications Commission (FCC)—one of the agencies that would approve the merger. Comcast donated thousands to almost every member of the Senate Judiciary Committee that will help oversee the merger approval process, with larger sums going to Democrats. The FCC and Justice Department must ultimately approve the merger. This entry was posted in Issues and tagged Al Jazeera, Comcast, David L. Cohen. Bookmark the permalink.